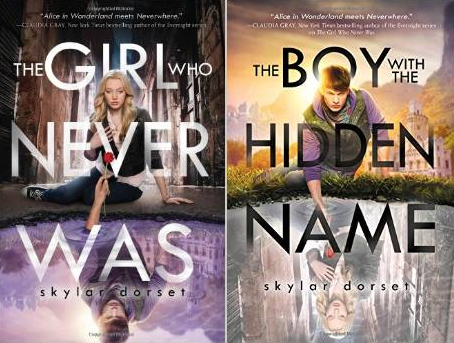 Skylar Dorset's novels The Girl Who Never Was and The Boy With the Hidden Name are mildly entertaining, thanks mostly to their unusual setting and solid romantic storyline. The series slides right down, but, sadly, there's very little in the way of memorable plot development to keep it from sliding straight back out again. Dorset's heroine is 17-year-old Selkie Stewart, a quiet girl from an old Boston family who discovers that the “flighty” mother who abandoned her as an infant is actually an evil faerie queen. Suddenly, nothing about Selkie's life makes sense: her relatives aren't who (or what) she thought they were, she is the subject of two wildly contradictory prophecies, and Benedict, the cute guy who sells sweatshirts and lemonade at the park by her house, is actually her magical protector. There are things I really liked about these books (Benedict's mercurial nature, the idea of Boston as a magical place, Selkie's gift for squirreling away useful items), but they just aren't enough to carry the rest of the series. Instead, Dorset cobbles together an entertaining but consistently underdeveloped fairyland adventure, and attempts to paper over the resulting plot holes and inconsistencies with her characters' romantic chemistry and mutual loyalty. Thankfully, Selkie and Ben have romantic chemistry and mutual loyalty (which places them several cuts above these poor fools), but Dorset's future books really need to feature some decent world-building and plot development as well.